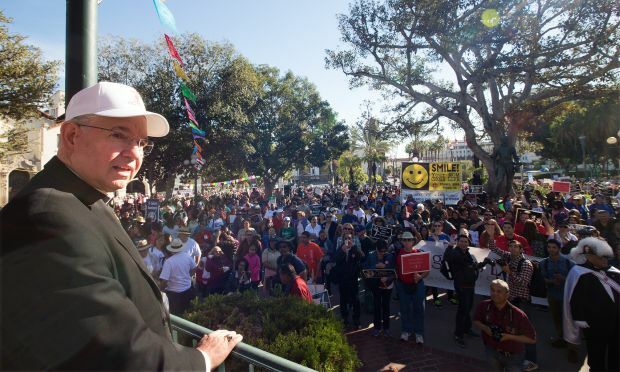 LOS ANGELES (CNS) — Los Angeles Archbishop Jose H. Gomez Jan. 17 led about 15,000 people from throughout Southern California in celebrating “the beauty of every human life” from conception to natural death at OneLife LA. Organizers said it was the first such large-scale pro-life event to be held in downtown Los Angeles and they plan to make it an annual gathering. On the same day in Denver, about 1,500 people gathered for the March for Life Colorado, which went around the perimeter of downtown Denver’s Civic Center Park to the Colorado Capitol. Beforehand, Archbishop Samuel J. Aquila of Denver celebrated Mass at the Cathedral of the Immaculate Conception. The Los Angeles event started at La Placita Olvera, the birthplace of the City of Angels, with remarks and a blessing from Archbishop Gomez and the auxiliary bishops of the archdiocese, as well as Auxiliary Bishop Dominic M. Luong of Orange; Bishop Gerald R. Barnes and Auxiliary Bishop Rutilio del Riego of San Bernardino; and Bishop Armando X. Ochoa of Fresno. OneLife LA was hosted by the Los Angeles Archdiocese and the Orange, San Bernardino, San Diego and Fresno dioceses. Financial sponsors included the Knights of Columbus, Right to Life League of Southern California, Dan Murphy Foundation, Carrie Estelle Doheny Foundation and the Catholic Communication Collaboration. Following the blessing, attendees participated in a Walk for Life to Grand Park, for a family-friendly celebration featuring music, exhibits and food, along with a roster of local and national speakers and testimonies from a family who chose life over abortion, a victim of human trafficking, a former foster child, and a young girl championing life while facing a terminal illness. Keynote speaker Ryan Bomberger shared his story of being adopted into a home with 13 children and talked about what inspires him to do the pro-life work he does as the chief creative officer of the Radiance Foundation, an organization he co-founded with his wife, Bethany. Speaker Angela Guandon described surviving human trafficking and Brandi Moore shared how, through the support of mentors she met through Kidsave, she survived an attempted suicide after living in 25 foster homes, where she was placed following a broken relationship with an abusive mother. Other speakers were Supreme Knight of Columbus Carl Anderson, retired professional baseball pitcher Jeff Suppan, and actors Patricia Heaton, Karyme Lozano and Eduardo Verastegui. Performing for the crowd were Mexican singer Miriam Solis and “The Voice” finalist Paulina Cerrilla. In addition, singer-songwriter Josh Garrels gave a free one-hour concert. Participants were encouraged to “Be Somebody to Somebody” in their own community championing life beginning at conception, and getting involved with good works through organizations that feed the homeless; find families for foster children; support pregnant women so they choose life; help to free victims of human trafficking; and walk with those facing the end of life. “America was founded on the great truth that all men and women are created equal and that God gives everyone basic rights that no one can deny or take away. Roe v. Wade turned this beautiful truth inside out,” he said. By legalizing abortion virtually on demand, the U.S. Supreme Court “in effect decided that human rights are granted by government — not by God,” Archbishop Gomez said. “That gives the government the final say — not only in defining what is right and wrong, but also in deciding who gets to live and who does not.